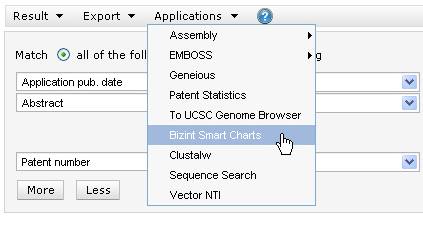 BizInt Smart Charts for Patents can build charts from search results from GenomeQuest. Additional details are provided in this pdf document. Create your results set on GenomeQuest. Click on the "Applications" drop-down menu and select "BizInt Smart Charts", as shown below. 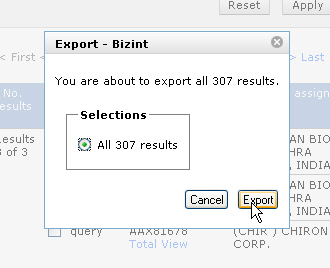 The "Export - BizInt" panel will appear showing the number of results you are exporting. Click "Export" to continue. Depending on how your computer is configured, BizInt Smart Charts for Patents may launch automatically. 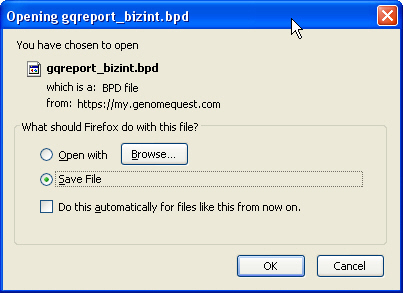 If it does not, you will see a dialog from your browser asking what you want to do with the .bpd file. You may save this file, to import at a later time, or open the file directly.